Browse > Home / Boyle Heights, Commerce Comet, Eagle Rock, East Los Angeles (LA City), East Los Angeles (Unincorp. ), Eastern Group Publications/EGPNews, El Sereno, General News, Lincoln Heights, Montebello, News / New Homeless Outreach Team Targets East, Northeast L.A.
New Homeless Outreach Team Targets East, Northeast L.A.
Councilman Jose Huizar last week introduced the new homeless outreach team for Boyle Heights, El Sereno and Northeast LA. Huizar worked with County Supervisor Mark Ridley-Thomas to bring a new intensive outreach team to serve those experiencing homelessness – specifically outside of Downtown LA, the councilman said last week. The new team includes a mental health worker, substance abuse counselor case manager, medical provider and a peer with lived experience, the same combination of teams that have had success on Skid Row. 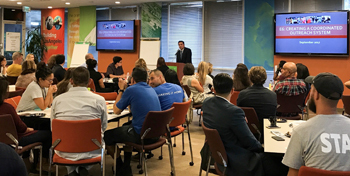 “More resources are needed from County partners to address the mental-health crisis in CD14 and beyond,” said Huizar, pointing out that a third of the homeless population struggles with mental health illnesses. “This is a key step forward, but we need more resources and immediate response teams for those experiencing mental health crises,” Huizar said.